I hope to present in a professional manner credible UFO-related material to the general public. I feel this is essential if this field of research is to survive. 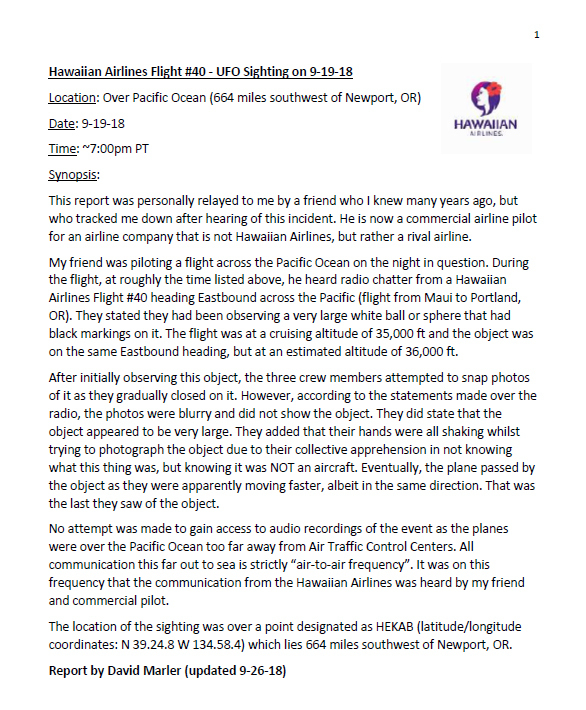 The damage done to the credibility of this field has been, in large part, due to questionable characters within the community of UFO research itself. Many self-promoting "researchers" have sacrificed credibility for the betterment of their own self-inflated egos. Coupled with this, is their desire to make this their sole means of financial support. In so doing, these individuals are committed to continually coming up with new material (regardless of its credibility) in order to survive. They must continue to have their radio listeners/subscribers and readers. I have always stated that rule number one in UFOlogy is "Never quit your day job!" Let me be clear, I have a successful full-time career and I do not need UFOs for financial survival. I do this because I truly feel there appears to be a phenomenon or phenomena that deserves greater objective scrutiny. I do not claim to have any definitive answers to this mystery. Rather, I am simply gathering data to try to gain some semblance of insight into what we are collectively dealing with regarding the UFO subject. One of my early lectures on triangular UFOs. Interview from the 2016 Ozark Mountain UFO Conference. The Battle of L.A. - UFO in 1942? Battle of L.A. - UFO in 1942? 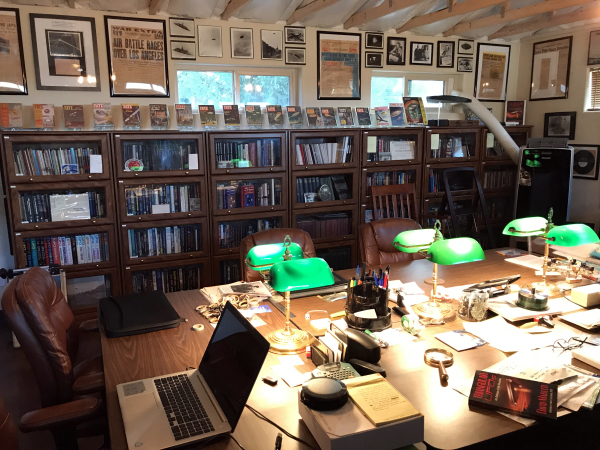 I am both honored and relieved that my extensive UFO library will have a secure and future home at the University of New Mexico (UNM) Zimmerman Library. 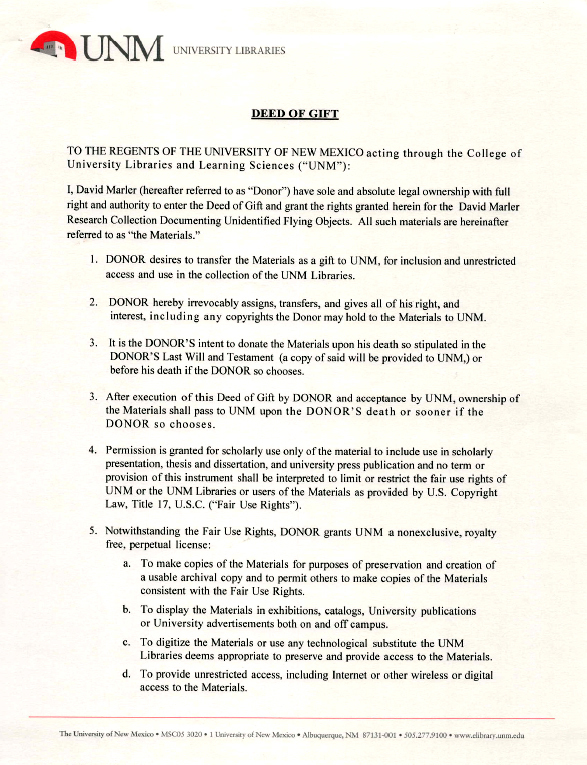 I have entered into a legal "Deed of Gift" that, upon my passing, will allow the University to take possession of my entire collection for long-term preservation. In addition, this arrangement will assure future generations of interested people and researchers access to this rare material in the decades to come. I would petition my colleagues and interested parties who may have rare, vintage UFO-related materials to consider donating these. Once in my collection, these items will eventually be donated to the University of New Mexico. An academic setting is the proper place for this material as it will guarantee preservation for perpetuity. I want to extend my sincere thanks to the University for their willingness to eventually accept this material. They, like me, agree that regardless of your "take' on the UFO subject, this is part of our history and culture and thus should be preserved. 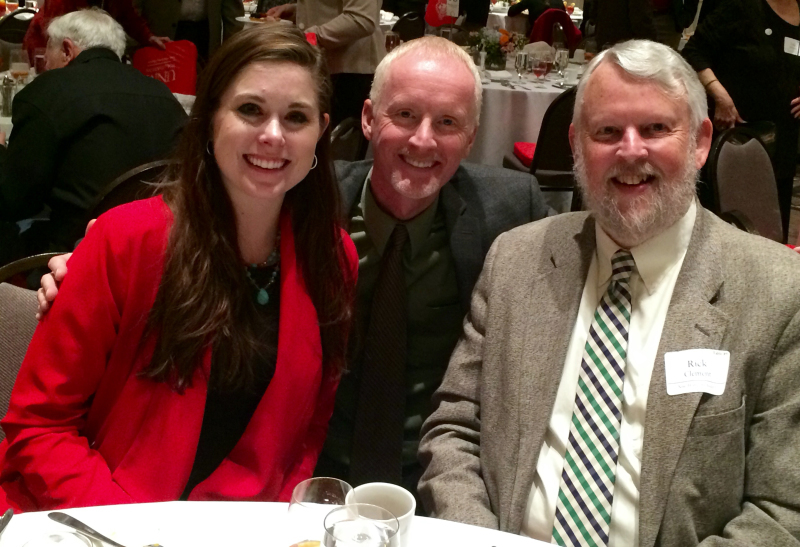 I was honored to be invited to the UNM New Horizons Society annual luncheon on March 21, 2018. This event was created to recognize individuals who have included UNM in their estate plans. It was a beautiful event that was well-attended. Pictured above are (left) Jessica Philbrook, Director of Development for the College of University Libraries & Learning Sciences and (right) Richard Clement, Dean for the University of New Mexico's College of University Libraries & Learning Sciences. 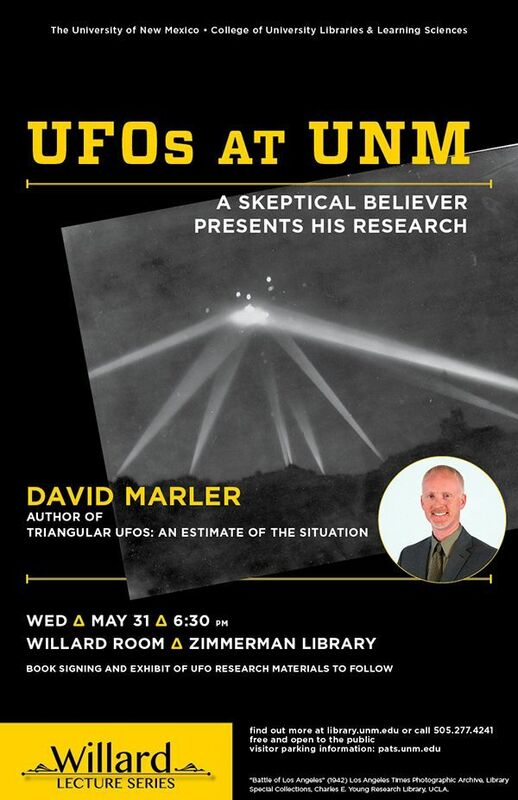 If you or those you know have credible UFO-related research or historical materials looking for a future home, consider UNM as a possible solution. I am content knowing my extensive collection of materials will be preserved there for future generations. There is no point amassing rare historical materials if one is not willing to share the information with fellow-researchers. These photos were taken in my research room in the Albuquerque, NM area. For anyone engaged in serious research into UFOs, you will find a wealth of information here at your disposal. 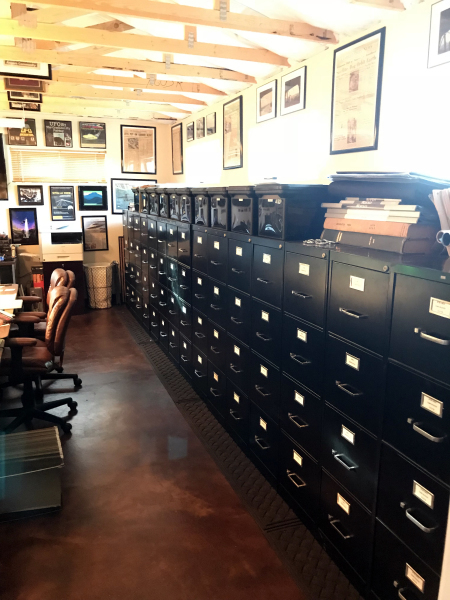 Recently, veteran UFO historian, Jan Aldrich, visited and was able to review and copy pertinent UFO information for his research endeavors. The research room has also been used for filming purposes. 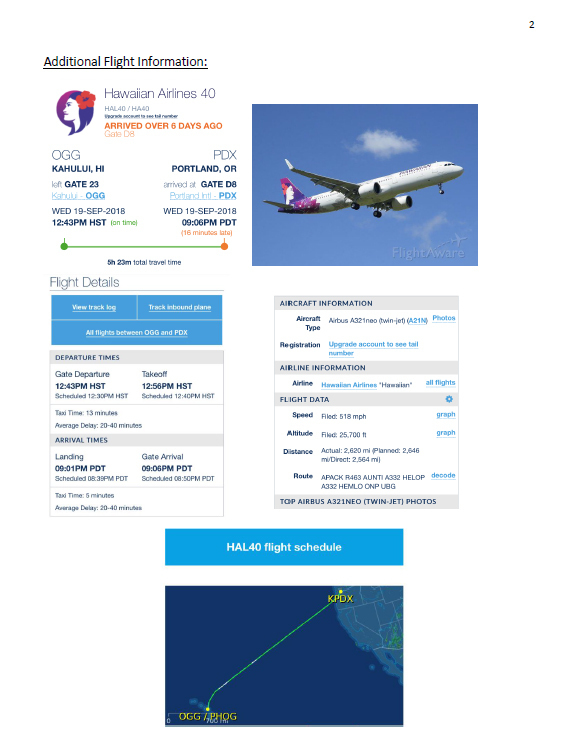 The most recent example being James Fox's new upcoming documentary. Not only was filming done, but James was able to use a copious amount of historical material for the upcoming film.